Charles is my Great Uncle, my Grandmother’s brother. He was born in Bramshaw, New Forest. As a teenager he purchased a penny farthing cycle. He tried to ride it and managed a short distance until he landed head-first in a near-by ditch. Although living in Bramshaw when young, his name is also on an old scroll from the Methodist Church at Cadnam. He moved from the New Forest and was the first of our family to own Chase Cottage, Shirrell Heath, Southampton. He worked as a cowman for Hubert Watson until he was ordered to sign up and fight for his country in the First World War. He asked his sister, Ellen (my Grandmother, also known as Nellie), if she would pay the rent, etc, while he was away in the trenches. 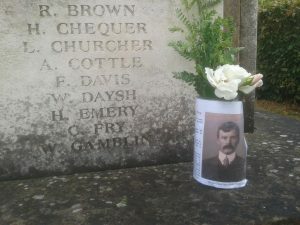 However, he was killed during the war and never returned to England. Ellen then took over the property. When Emma Fry died in 1893 at the age of 37, it was probably in giving birth to Emma Edna. It fell to the two eldest daughters still at home, Beatrice, 13 and Ellen, 12 to run the household for their father, Edwin and look after their younger siblings. These consisted of Sidney, 10, Charles, 6, Hester, 4, Winifred, 2 and the baby Edna. Their home was Kew Lake Cottage, near Warrens Home Farm, Bramshaw. The eldest child, Eva May, in 1891 aged 12, was lodging with her Aunt and Uncle, Walter and Miriam Harding in Wandsworth. Their father, Edwin, was originally a farm labourer, but by 1901, he had progressed to be a shepherd. The census of that year shows the family gradually splitting up; Ellen had moved to Wandsworth to work as a postal clerk with her now widowed aunt, Marian (Miriam) Harding, who was a sub-postmistress. She also took her sister Hester with her. 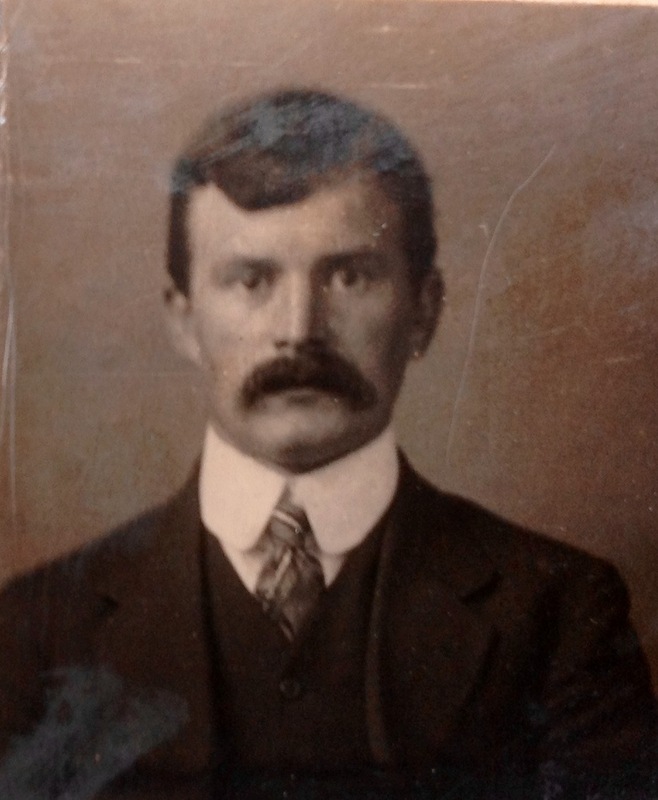 Sidney was working as a cowman for Henry Huntley of Charlton Marshall, Blandford. Charles was working as a Diary Boy but still at home with his two younger sisters, Winifred and Edna. Beatrice continued to keep house, a role she was still fulfilling ten years later when only she and her father remained at Kewlake. 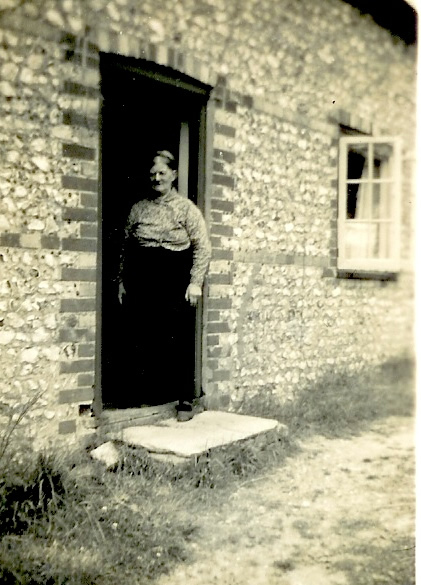 Like his brother, Charles, aged 24, was working as a cowman and in 1911 was lodging at Shirrell Heath, near Botley. 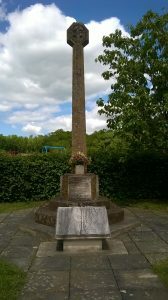 Charles enlisted at the nearby town of Fareham and joined the 1st Battalion of the Duke of Cornwall’s Light Infantry (DCLI) in about July 1916. He went to France, but the 1st Battalion came out of the line at the beginning of September 1917 and went into billets at Ambrines for rest and refitting. After 15 days of fine weather spent training and relaxing, the battalion left to march to Ligny, then by train to Audricq and another march to La Communal arriving at 7.00 a.m. on 25th September. Further moves brought the unit to Meteren on the 1st October before going into the Reserve trenches at Sanctuary Wood. This was the offensive by 2nd Army in which the task of the 5th Division was the capture of the spur south west of Reutel. Two Brigades, 95th on the left and 13th on the right provided two assaulting battalion each. 1 DCLI was on the left and 1 Devons on the right in the 95th Brigade. The attack began at 6.00 a.m. on 4th October. Charles’s battalion was initially held up by pill-boxes but, these were captured with the help of a tank. However the troops were subject to severe artillery fire and had to withdraw to a less exposed position in the area of Cameron Covert. Overnight the battalion was reinforced by 1 East Surreys although the left flank was not subject to counterattacks. 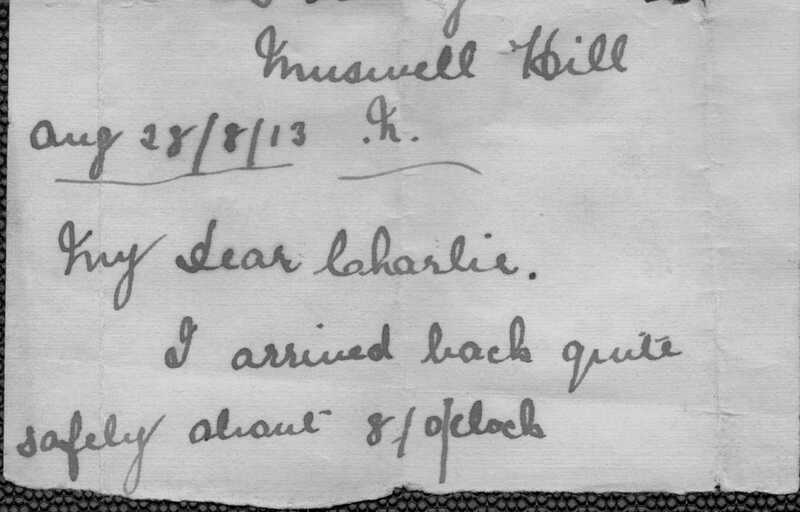 Charles was fighting with the Trench Mortar Battery of his battalion and it was the next day, 5th October that he was wounded by hostile artillery fire. On 11th October, 5th Division was relieved by 14th Division and moved to the Westoutre area. On recovery, Charles was assigned to A Company as a stretcher-bearer. Following a period in camp reorganising and training, the 95th Brigade moved back to Reserve trenches on 28th October. They experienced enemy barrages that included gas shells over the next few days. On 5th November, 1 DCLI relieved 1 Norfolks at the assembly position and the following day at 6.00 a.m. launched an attack on Polderhoek Chateau (See page 321). The Cornish men were the assault battalion, A and B Companies leading with C and D following closely and with 1 Devons in support. When our artillery barrage started the Germans immediately replied with artillery and a heavy machine gun barrage. The first wave was stopped by direct machine gun fire and the support companies advanced but suffered considerable casualties. The men had to withdraw as they were bombed and machine gunned. At about 8.00 a.m. a German artillery barrage of two hours prevented further movement. Eventually the men were brought back and a line formed, only for more casualties to be taken when our 18 pdrs. began firing at a reduced range. Further withdrawal was made in line with the original assembly position. 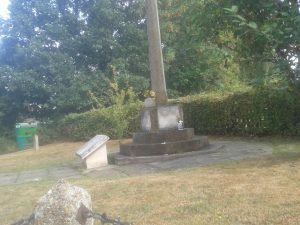 The line was consolidated during the night and Charles’s battalion was relieved by 1 East Surreys and withdrew to Bedford House on the night of 6th/7th November. Extensive casualty lists with the battalion war diary record that Charles was wounded in the attack on the 6th November. He was taken to No. 3 Canadian CCS suffering from shrapnel wounds to his right thigh. He died of these wounds three days later. 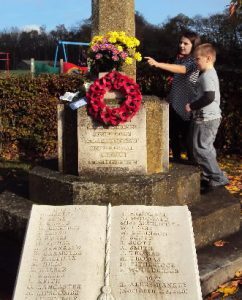 Charles’ name is engraved on the War Memorial at the cross-roads of Church Road and Winchester Road at Shedfield, Nr Southampton (see below with Georgia and Sam Henry-Dobbyn [my grandchildren] laying flowers on Remembrance Day 2011. He is also honoured inside the church at Bramshaw on a plaque commemorating all the men lost from that village in the World Wars.